Why do some of the silver shekel coins from Bar Kochba revolt have a wavy line over the Temple and others a star? The two coins are very similar, silver shekels overstruck on Roman tetradrachms, among the most religiously significant coins issued by Jews, because “the Holy of Holies of the Jerusalem Temple is depicted, with the Ark of the Covenant”. Note the Ark was not in the Second Temple – according to Prof. Dan Barag (d. 2009) and others, it is the Shewbread Table. 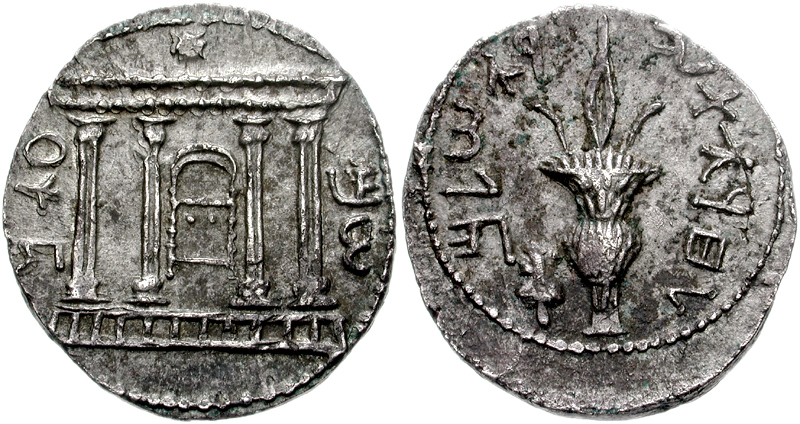 The name “Shim’on” (referring to the leader of the Revolt, Shim’on (Simon) Bar Koseba) appears on both coins in paleo-Hebrew split between שׁמ on the right and ֵעון on left of Temple. The star appeared above the Temple on many coins, in reference to Bar Kochba’s nickname “Son of the Star”; perhaps the wavy line represents the entablature. On the reverse the image and text are the same, lulav/palm branch and etrog/citron with “לחרות ירושלם/to the freedom of Jerusalem”. Shmuel: Thanks for a most interesting post! I have long been fascinated by the seeming “disconnect” of the Tyrian-style coins, bearing not just images but indeed the head of a pagan god, being specified as the prescribed Temple tax — by the Jewish Temple authorities themselves. This, at a time when we believe pious, observant Jews were otherwise scrupulously against images — witness Josephus’ story of the Jewish delegation sent to Caesarea to protest Pilate’s display of imperial shields in Jerusalem. Perhaps it is not too harsh to say that the requirement of the Tyrian coin was mercenary on the face of it — it represented a known standard, i.e. guaranteed value. What I did not know till now, however, was that the Temple authorities were actually minting these coins themselves, in Jerusalem, beginning in 18 BCE. This means they not only specified the coinage and sold the money-changing concessions (to the highest bidder, no doubt) but also held complete control over the supply. It makes them all the more complicit, it seems to me, among the “den of robbers” Jesus railed against — the whole for-profit, “business” aspect of the Temple system.